The possible title screen for the game. 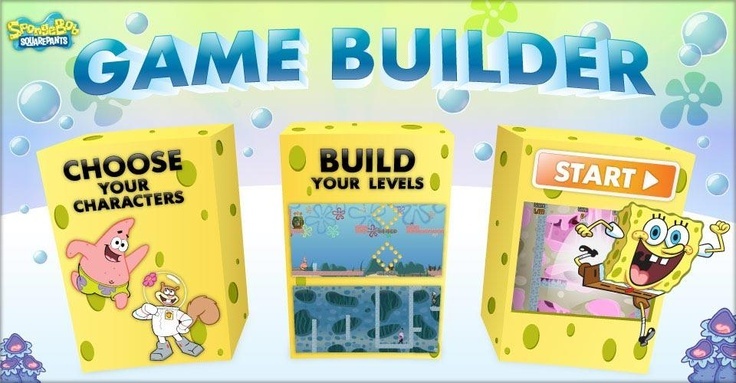 From 2009 until August, 2013, there was a Nick.com Flash game known as the Nickelodeon Game Builder. 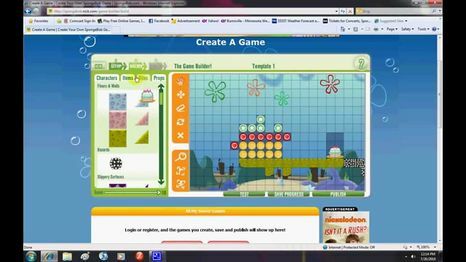 This Flash game allowed users to create their own levels using assets based on various Nickelodeon properties. Several variants of this creator were released, based on Spongebob, iCarly, The Penguins of Madagascar, Fanboy and Chum Chum and Avatar: The Last Airbender. Two different versions were released. The first version had a much smaller frame than the second version, but it included checkpoints, along with the ability to change the character and background that appeared on the level's title screen. The second version had a much wider and larger frame and a revamped interface, but removed checkpoints and the ability to change the title screen in any way. It's believed the way the title screen looked depending on the character you chose for the level. The player could choose which character the player chooses to play as, and all of them play identically with double jumps. The games were removed from the site a few years later, making them unplayable. However, the games can still be accessed, but are buried in the site. The catch is, you can't actually play the games, as an error message will pop up. This is because the site is attempting to load the .swf files, but it can't. A video showcasing gameplay of the Level Builder. A video showcasing a glitch. A video showcasing the building aspects of the Game Builder. A video showcasing some Patrick gameplay. A video showcasing the building aspects of the Game Builder and the available presets. A screenshot of the Level Builder in action.